Color: Cheetah brown. Material: Glitter textile and leather. Lining: Leather. 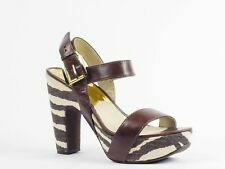 VIOLET BROWN/BEIGE ZEBRA PRINT CANVAS LEATHER ESPADRILLE WEDGE PLATFORM. BROWN/BEIGE (ZEBRA PRINT). NEW WITHOUT BOX. MADE IN: CHINA. RUBBER SOLE. TEXTILE/LEATHER UPPER. Model: 40S3YVHA1D. Style: Yvonne Ankle Strap. Color: Gold Glitter. Size: 9.5M. COLOR: cheetah brown. MATERIAL: Glitter. HEEL HEIGHT: 4.5" heel/ Platform 1". Photos maybe brighter or darker depending on your screen settings. Color: Ivana. Heel Height: 5" heel with 1 1/2" platform. Gold-tone hardware. Adjustable strap. Color Fuschia Size 8.5M. Fierce yet feminine, the Gillian belongs in every girl’s spring closet. Cutouts render the canvas design both flattering and contemporary, while the wedge lends a natural feel. IVANA TIGER PRINT. Designer color: Mocha/ Tiger. OPEN TOE SAND ALS / HIGH HEELS. Color: BROWN and CREAM. Open round toe. Vachetta leather upper. Natural jute wedge heel. Adjustable buckle closure. Wood-like platform. Platform Height: 1 1⁄4 in approx. Photo Information It is your responsibility to know your size as sizes may vary depending on the clothing manufacture and or the designer. This daring sandal features an appealing open toe design, solid black leather upper and eye-catching platform design. Zebra Print Along Wedge. 5" Heel, 1.5" Platform (feels like 3.5"). Black Leather Upper and Leather Lining. They are high heel mary jane shoes. They are patent leather upper and rubber sole. Heel high : 4.5". Length from the sole : ". Width from the sole : 3.5". They have strap with silver buckle. 4.5" heel, 1" platform. Every item we list is inspected by hand individually; all photographs are of the exact item you will receive. Cotton canvas upper; rubber sole. Bring sass and sophistication to your ensembles with the Irene Mid Sandal. Leather/ printed canvas upper; Leather lining; Rubber outsole. 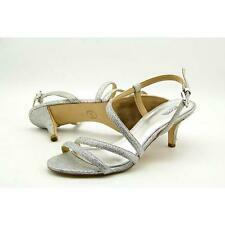 Adjustable slingback with gold tone buckle for easy on/off. Every item is carefully inspected to ensure that you receive a quality product. 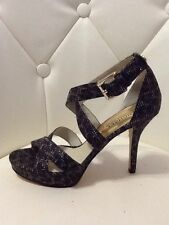 Heel sling strap with buckle closure. Tiger print canvas platform and heel. Leather upper. Shoe: Evie Platform. Color: Cheetah Brown. Material: Synthetic Glitter. Style: Platform. KORS Michael Kors Cynthia snakeskin/python espadrille wedges. Adjustable ankle buckle straps. Absolutely gorgeous! MEASUREMENTS (laying flat) Platform: 2in height. Size 10m. Great condition.